Dounreay has started to trial the processes that are needed to close the site. Dounreay’s Environmental Closure & Demolition (ECD) team is embarking on the characterisation, remediation and restoration of “Zone H2” to trial the processes necessary to deliver the Interim End State (IES). Zone H2 is situated at the eastern end of the site where the now-demolished plutonium labs once used to stand. The team is using part of Zone H2 to trial the characterisation process, focusing on residual ground and infrastructure contamination from historical areas of concern. They have produced a desk study which picks out “areas of potential concern” for investigation, and also unearthed unexpected features that need further investigation. The characterisation work is currently underway and will inform on the presence or absence of contamination, using various techniques which include soil and water sampling. The project team is working together with the Fuels Directorate and the Waste Directorate, developing co-operation between the teams and disciplines. The project will develop preferred methods of investigation and remediation techniques, and will be used as a template for costs, timings and the process to be applied as, one by one, areas of site are released to ECD over the years to come. 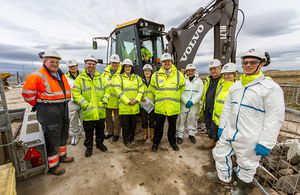 Dounreay managing director, Phil Craig, and deputy director, David Lowe, visited the site to see the work in progress. Project manager Julie Morgan showed them the investigation into the site of the former criticality test facility, demolished in the early 1980s. Phil Craig said: “I was delighted to see first hand the ‘One Dounreay’ mentality on display within the Zone H project team. “ECD, Waste, Assurance and Fuels have really come together to share learning, drive continual improvement and deliver a more effective and efficient solution to move the programme forward.